My sister Nancy is celebrating her birthday today and I am celebrating it here. I am hoping you all send good vibes her way. Nancy deserves the best. My sisters are my rocks. I would be lost without them. I write something here every year on their birthdays, but I hope they know this on the other 364 days. I love you Nanc. I hope this is a great day and the start of a great year for you. 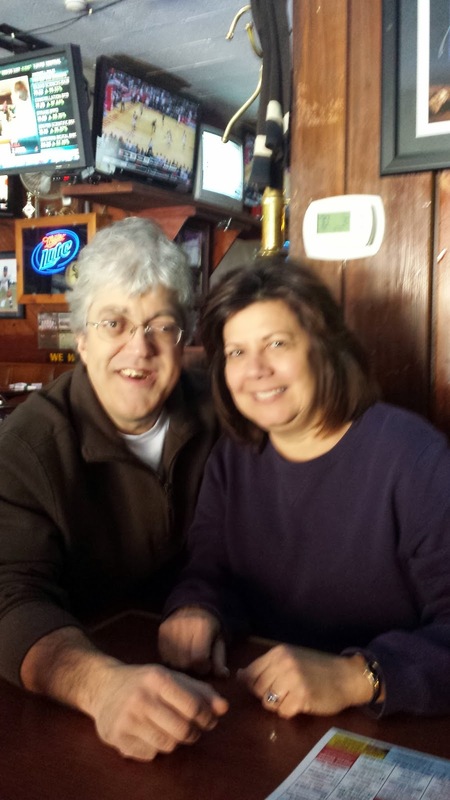 Nancy and me In Skokie, IL-February 2014. Happy Birthday!!! You are indeed a great sister … have a great day and year!!! Ok, first let me start by saying that I'm truly sorry that you have to have HIM for a brother, but we won't hold that against you or Jean. That being said..... Where's the CAKE? P.S. Don't expect a personalized autographed 8x10 from your brother for your birthday... He would have to charge you $30.00 for that! EZ … you are a funny one … but I am very lucky to have John as my brother !!! Winning the Lottery is LUCKY!!!! You both mean the world to me and I am so blessed to have you both as siblings. I couldn't ask for a better brother or sister. Love you both. WOW... Jay Leno has you two brain Washed!!!!! Don't tell me he sold both of you $30.00 autographed 8x10's too!